I recently built an interactive org chart for the Articulate Weekly Challenge and subsequently got a few messages from people asking me for guidance on how to build it out. As a result, I thought this would make a great topic for a video tutorial. 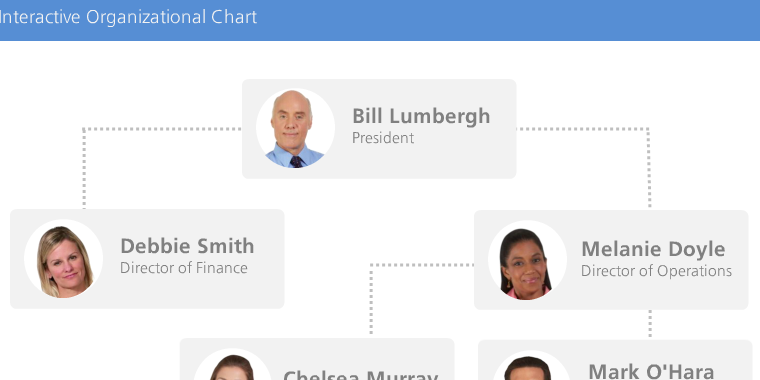 This video tutorial demonstrates how I easily built this interactive organizational chart using shapes, triggers, layers and a few animations. Do you have any tips of your own for creating interactive org charts? If so, please leave a comment below. And don’t forget to check out this week’s E-Learning Challenge! This is great! Can't wait to try this myself! OMG! I love this interactive org chart. Thank you so much for sharing. I can not wait to use this at work!!! I am working on a similar project now AND am new to Articulate so this demo is sooooooo very helpful! Thank you. So glad this was helpful for you Margaret, thanks for your comment!